Yale Peabody Museum, Great Hall. Photograph by Mark Ryan. 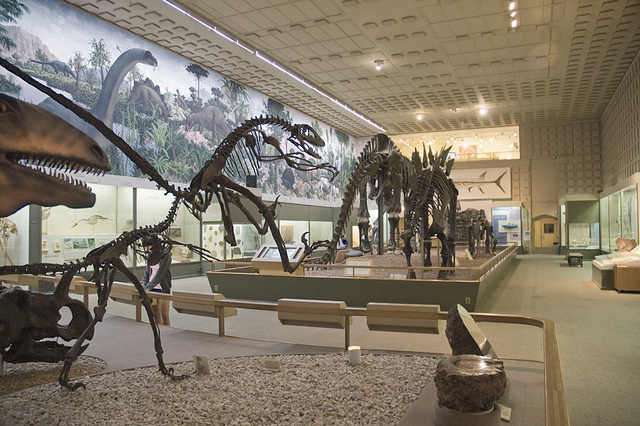 The Yale Peabody Museum is home to one of the world’s largest murals, The Age of Reptiles, which illustrates changes in the earth’s flora and fauna between the Devonian and Cretaceous periods. Yale-trained artist Rudolph Franz Zallinger worked on the project from 1943 to 1947. He collaborated with paleontologists, paleobotanists, biologists, and others to base its depictions on the best science of the time and, in recognition of this artistic and scientific achievement, Zallinger received the Pulitzer Award for Painting in 1949. The mural can still be seen today in the museum’s Great Hall, where it spans the full 110-foot length of the east wall.